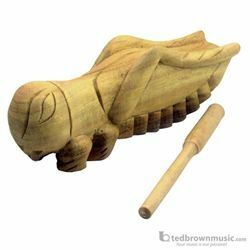 Ted Brown Music - IAS Cricket Sound Effect Wooden Small 5"
Accessories / Whistles and Sound Effects / IAS Cricket Sound Effect Wooden Small 5"
Just like the frogs, these zippy little crickets will capture your heart. The crickets are available with lacquer finish only. They are played by rubbing the playing stick over the ridges on their legs to create a genuine "chirping" sound. Looks real too! Playing stick included. Woodgrain/Coloration's vary. Hand made in Thailand.